The prominence of gender inequality in disasters and exposure to sexual and gender-based violence (SGBV) after disasters are increasingly recognised. In 2013, the global Call to Action on Protection from Gender-Based Violence in Emergencies (Call to Action) was formally launched by the UK and Sweden with the aim of driving change and fostering accountability in all phases of humanitarian emergencies. An active member from the start, the European Union (EU) took over its leadership in June 2017. Its continued support to the Call to Action was reiterated through commitments at the World Humanitarian Summit, and is reflected in the EU Gender Action Plan 2016-2018. Despite these important developments, there is still relatively little knowledge about the role that law and policy can play in strengthening gender equality and protection from SGBV in disasters. The International Federation of Red Cross and Red Crescent Societies (IFRC) has carried out ground-breaking research to contribute to addressing this gap – the results of which were presented during a thematic discussion hosted by the European Parliament Rapporteur on Humanitarian Aid, Enrique Guerrero Salom MEP (S&D, Spain) at the Permanent Representation of Sweden to the EU on 7 November. Minister Counsellor, Helena Lagerlöf opened the discussion on behalf of the Permanent Representation of Sweden to the EU stressing the centrality of gender equality in Sweden’s foreign policy. “Freedom from violence is essential to women and girls’ human rights”, she underlined, while highlighting that SGBV often increases in conflicts and humanitarian disaster settings due to factors like the separation of families and social networks, and the breakdown of norms and infrastructure. Director of the Red Cross EU Office, Denis Haveaux, also emphasised the Red Cross Red Crescent Movement’s commitment to addressing the issue, sharing how local volunteers can help to ensure minimum requirements for SGBV mitigation and response in emergency work, given their presence in communities before, during and after disasters. “It is critical that humanitarian actors ensure that their own organisations have strong gender equality, and specific SGBV protection standards and training mechanisms in place”, he added. 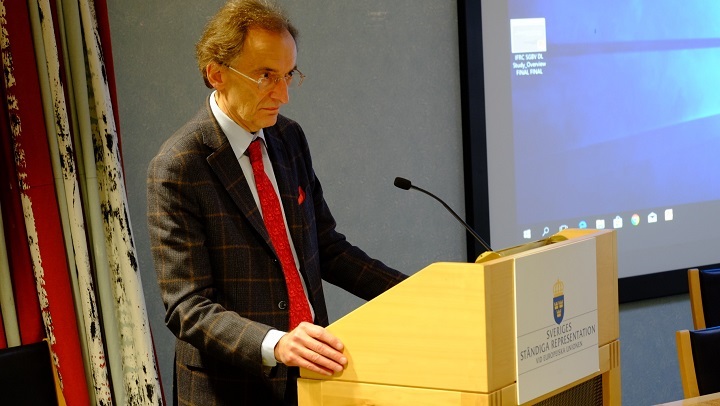 The keynote speech was delivered by Jean-Louis de Brouwer, Director at the European Commission Directorate General for Humanitarian Aid & Civil Protection (ECHO). Mr de Brouwer pointed out that “SGBV is the most blatant and brutal denial of humanity”, and thus fighting it is at “the core of what humanitarian aid is all about”. He went on to describe the Commission’s three priorities during its presidency of the Call to Action: 1) enhancing advocacy – including towards humanitarian professionals, 2) planting gender and SGBV at the center of ECHO’s protection agenda in the field, and 3) increasing prevention through awareness raising – instilling the rules of a possible cultural change. 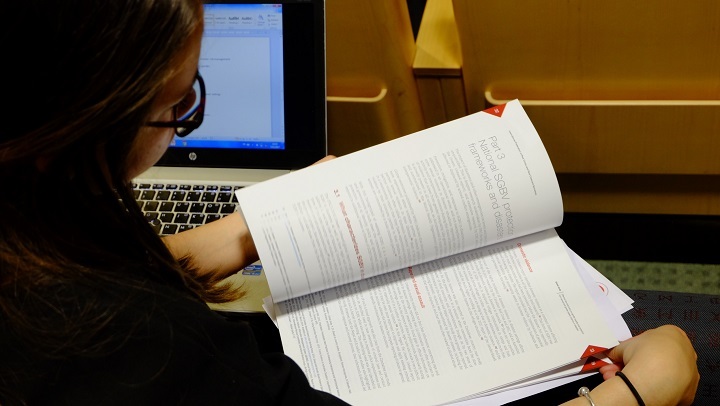 The key findings of the IFRC’s research – which involved a global desk-review, interviews with key stakeholders and country case studies in Ecuador, Nepal and Zimbabwe – were presented by IFRC Senior Legislative Advocacy Officer, Lucia Cipullo. By reviewing the relevant legal and policy landscape relating to disaster risk management (DRM), gender equality, and SGBV, the research revealed a disconnect and lack of coordination between these legislative systems. 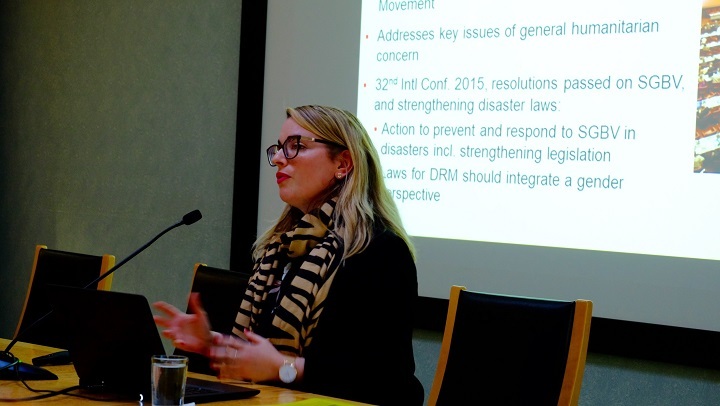 “There is often little or no connection between law and practice in disaster settings, nor are there many coordination mechanisms in place to address this disconnect”, said Ms Cipullo. She also highlighted a lack of resources for implementation as a barrier to the effectiveness of law and regulation, while underlining the urgent need to increase the meaningful participation of women in DRM systems. “We recommend that governments take action to ensure that existing SGBV frameworks are resilient and function effectively in disasters”, she added. Dagmar Schumacher, Director of the UN Women Brussels Office, noted the specific role played by women and girls in strengthening resilience and preparing for, responding to, and recovering from disasters at the community level. She identified some of the international normative frameworks that can be utilised by policy makers and advocates, but also pointed to lack of implementation as a key barrier. “The review of 95 national submissions of the 2013-2015 reporting cycle [of the Hyogo Framework for Action] highlights that the slowest progress in implementation was in the area of gender responsiveness”, she said. “The EU can play a very important role in supporting states to have more gender response legal frameworks in place through bilateral dialogues with third countries”, added Hanna Persson, Gender and Diversity Advisor at the Swedish Red Cross. “The Call to Action is also an excellent opportunity to engage states in reviewing their own laws and policies… the EU can look at its own civil protection legislation and how Member States’ legal frameworks are responsive to sexual violence”. Enrique Guerrero Salom MEP closed the conference by highlighting that states, together with the Red Cross Red Crescent Movement, have made international commitments to address these issues, namely in Resolution 3 from the 32nd International Conference of the Red Cross Red Crescent in 2015. He also commended the IFRC’s research as an important step towards understanding where there are gaps, and how law and policy can be used as a tool to create an enabling environment for states, humanitarian actors and those operating in disaster contexts to overcome this critical issue.